Learning the letters in your name is an important skill. Generally, some of the first letters a child will learn are the letters in his own name. One of the first letter learning activities I did with my son came from Making Learning Fun. I printed all of the Highway ABC Cards in the letters of his name. He drove his trucks around saying the letter and the path of movement for the letter... big line down, little line, etc. Pretty soon he was interested in the letters in his name. I decided it was time to explore getting those letters in the correct order and making his name from left to right. 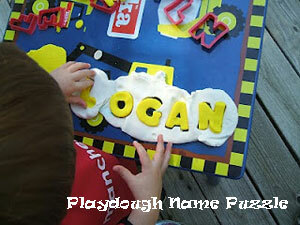 We made this playdough name puzzle. Every child learns in a different way. An activity that works well with one of your kids may crash and burn with another kid. My second son is a completely different character with a completely different way of learning than my oldest. I wanted to compile a resource list of practical and powerful ways for your child to work on learning the letters of her name. I asked a group of bloggers who are experienced experts in areas of early childhood, literacy and play to share some of their best posts on learning letters. 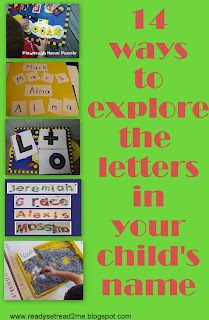 Together, we have 14 ways to explore the letters in your child's name! You can watch a video that gives a brief overview of each activity. Check out the posts for directions and additional information. If you are considering pinning the activities, please go visit the blog so the picture stays with its original source. 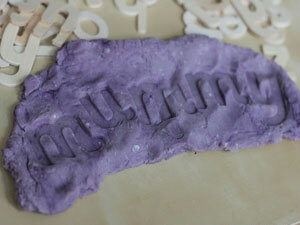 Nurture store shares a whole post of tips for learning to write your name. My favorite tip? Write your child's name everywhere. When your child creates a work of art, always write his name on it... until he can start writing his own name! All of the tips in this post are easy things you can squeeze into any day. 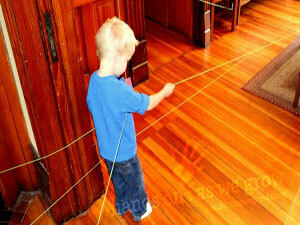 Hands on as we Grow taught her son the letters in his name by using this string scavenger hunt. I love that she found my Follow the Line Scavenger hunt and used it for her son's name! True collaboration. Time for Play- This name game using rocks is great for teaching kids left to right directionality. 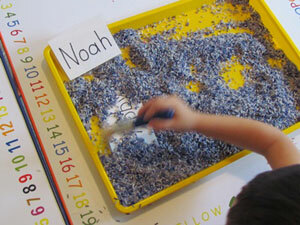 I love that this name game by Teach Preschool is a shared activity between two children! 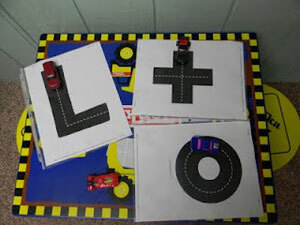 You can find the directions for this game that helps children work together to build their names letter by letter at Teach Preschool. Happy Hooligans shares this easy name puzzle. She even found a way to make the letters textured. If your child isn't impressed with paper/pencil activities, try wooden letters plus playdough name practice from The Imagination Tree. 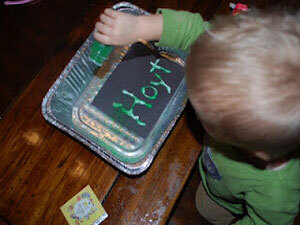 Switch out the Playdough and try salt tray writing from Creative with Kids. Only have paper and pencil? You can still make a great tactile name project. 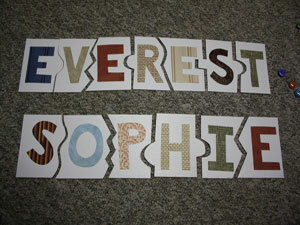 Use a little glue and cut your paper into pieces to make a name mosaic. Rainbows Within Reach has some great examples worth taking a look. Mom to 2 Posh Lil Divas has a similar name mosaic. 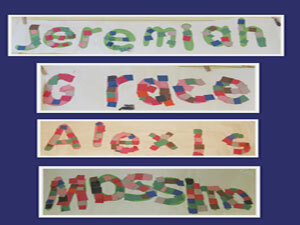 She kicked it up a notch by using lots of fun supplies in their name mosaics. Kindergarten & Preschool for Parents & Teachers shares a lists of tactile ways to practice writing the letters in a child's name. Put down the pencil and pick up the M&M's, Shaving Cream, Playdough, or rainbow crayons. This kindergarten teacher also shares a super important tip that all kids need to know before arriving in Kindergarten! 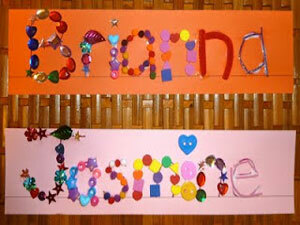 Mommy with Selective Memory shows you how to make these tactile name cards (not made with glitter). Not only are these fun to make, they would be great for allowing your child to practice retracing the letters of his name. I don't know if girls like to dig. I only have sons- and nephews! This digging up the letters of your name from Teach Preschool would be a great way to entice my boys to particpate! I'm guessing most girls would love it too! 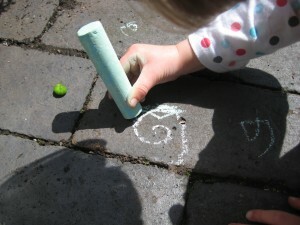 Do you have a great idea for teaching your child the letters of his or her name? Please share it! I'm so honored that you've included my blog article on letters from "M is for Mosaic" as I think the idea would make such a delightful project for every young child. It's cool to see how our Posh Mommy had a parallel idea! This whole collection is awesome in every way. I'm over the moon to be 'published' in the midst of these brilliant minds! Thanks for these great ideas. My daughter has suddenly started spotting letters everywhere, particularly all the family's initials. These will be very useful to encourage her development. Thank you so much for including my link in your beautiful post. It is a wonderful source of inspiration and ideas! I'm following you and pinned it! Thank you and have a wonderful fun day. We recently made a name flower garden. we painted coffee filters with water colors, added stems, and hung them on the wall in a line. 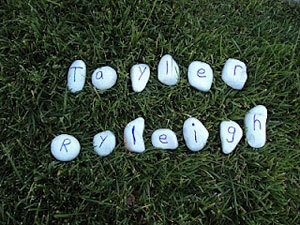 I then wrote the letters of my daughter's name in individual circles and she added them as the center to the flowers. I will be adding a photo to my blog soon at tootsiestotschool.blogspot.com! 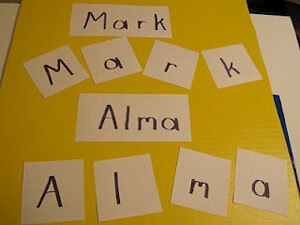 Check out my blog post on all kinds of ways to help your child read using his/her name. Thanks for the roundup. Lots of neat ideas. What a great list of ideas and tips for learning how to spell and write their names - Love this! And thanks for sharing this on Hey Mom, Look What I Did at Adventures In Mommy Land...hope to see you again sometime! Amazing!! Thank you for such a great resource for parents and teacher alike! If I can find this post on FB, I'm sharing!!! Great post. Heaps of ideas here. Always looking for letter learning ideas for my teaching bag! Thanks for linking up to The Kids Co-op! 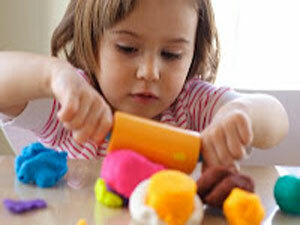 These are great tactile activities that are fun and teach! I have done sandpaper letters and pieces of string to trace along the letter and mimic the directionality of writing. Starting when my children were infants, using the tune to the song "Bingo", I substituted the letters of their name while changing their diapers. They would be still and so enthralled in hearing the song. My son uses the song now as a mnemonic device when writing his name if he forgets which letter is next. We also hung the letters of their names in their rooms from day one and would point to the letters as we sang. I known this is a common occurrence nowadays. Thank you for this creative list. I really like all of these ideas to teach the letters in a name. They are so creative. Thanks for putting so many great ideas together! I love these ideas, and the fact that so many of them are so simple is great! I can't wait to try them and see which my boys like the best! Hopefully that will give me a little more insight into how they learn! Very nice! What a great resource for parents and teachers looking for ways to explore letters. Children love to learn their own names. LOVE LOVE LOVE this post!! I'm featuring it on Thrifty Thursday in fact!!! Your posts are always full of amazing ideas, thanks for sharing! Such an awesome roundup of name games for kids!! Pinning. I love this roundup, Jackie! I shared it on my Facebook page as part of our KBN shout out.